Here's a terrific gradebook template designed specially for elementary classroom teachers. Download the gradebook and open it up on Microsoft Excel or OpenOffice Calc. Enter your student names and grades. The spreadsheet will calculate student averages for each subject. It's completely free from Super Teacher Worksheets! There are plenty of Excel Gradebook templates online, but I haven't been able to find a good one that meets the unique needs of elementary school teachers. After many requests from visitors, I've finally added a high-quality gradebook for the site. Download the Super Teacher Gradebook for free! 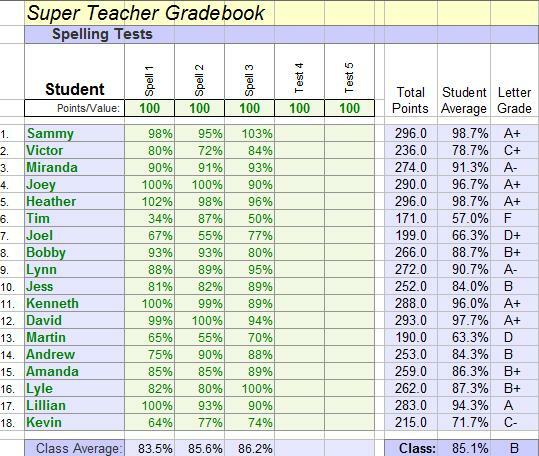 An Excel version of the "Super Teacher Gradebook." Each subject is tabbed at the bottom, so you can keep track of grades in all areas. Q. What software do I need to use the Super Teacher Gradebook? A. You will need Microsoft Excel or OpenOffice. Q. Excel? I don't have that! A. If you don't have Microsoft Office with Excel, no problem! You can use the gradebook spreadsheet with OpenOffice Calc instead. It's a free piece of software that does everything Excel does! Download OpenOffice by clicking here. Q. Do I need to know how to use spreadsheets? A. Not really. Just enter your student names and grades in the correct places. The formulas and layouts are already set up for you. Q. Is it possible to mess it up? A. Yes. Please don't enter numbers in the averages boxes or any place besides the boxes for grades and names. If you alter the formula boxes, the spreadsheet may incorrectly calculate grades. Enter only names and grades and you'll be fine. Q. I screwed up the formulas, where can I get technical support? A. Sorry, no technical support is available. My friend Donny created this amazing gradebook spreadsheet as a favor to visitors of this Website. I don't know how to fix spreadsheet formulas at all. Be sure you backup your gradebook on a regular basis so your grades are never lost. Q. Does the gradebook cost anything? A. The grade book is free. You do not need to be a member to download it. Q. I prefer to keep track of grades with paper and pencil. Do you have any blank gradebook forms? A. Yes, we have printable gradebook pages on our Teaching Tools page. Q. Is this gradebook available for secondary teachers and/or special area teachers who have multiple classes? A. Sorry, not at this time. The Super Teacher Gradebook is designed for classroom teachers who teach all subjects. There are many other gradebooks available online - you can find them by doing a Google search for "Excel Gradebook". Q. I've got the gradebook up and all I see is "Reading Grades." How do I enter grades for other subject areas? A. There are small tabs near the bottom of the screen. You'll see each subject listed. Just click on the subject you're looking for. Q. How do I download this awesome gradebook?